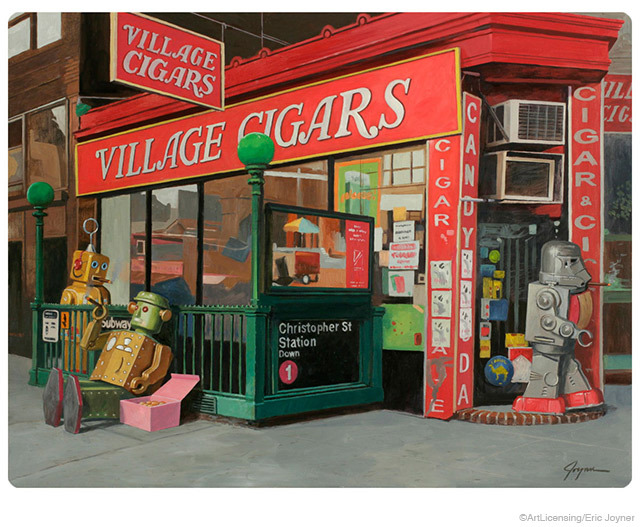 Retro robots meet 1950s Main Street! 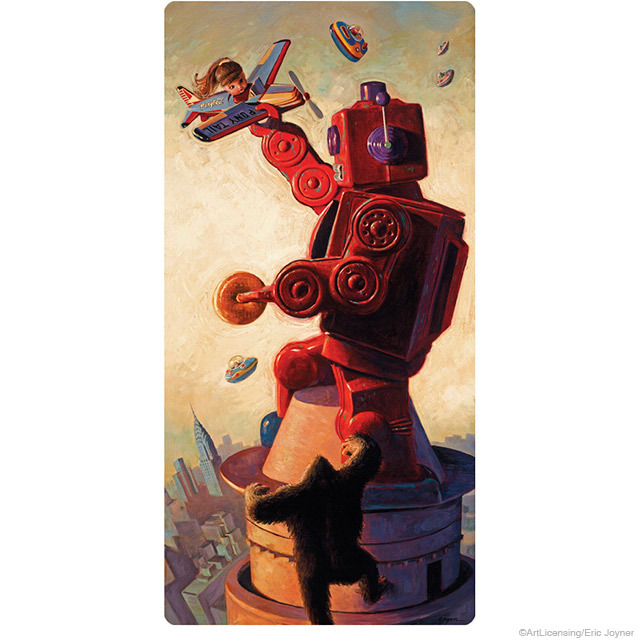 We’re very excited to introduce a series of metal signs, wall decals and stickers featuring the charming work of San Francisco artist Eric Joyner. 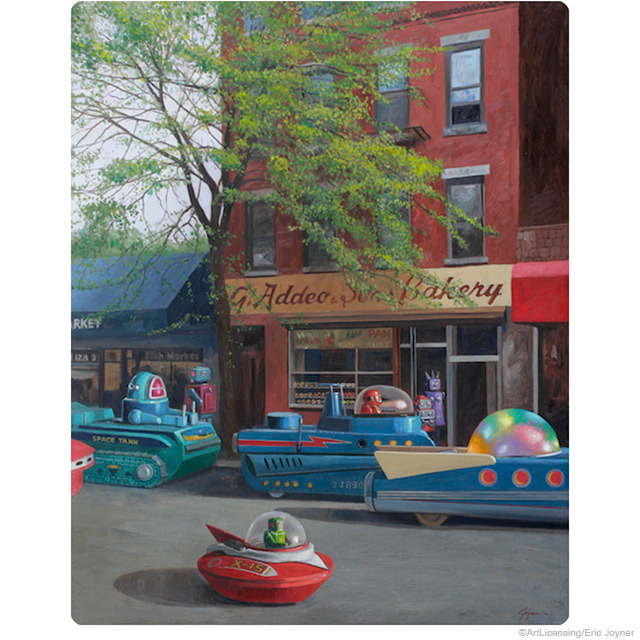 It was Joyner’s robots that caught our eye – they’re based on tin toy robots from the 1940s through 1960s, which Joyner collects – but it’s pretty clear there’s more going on here! The robots have arch enemies in the form of . . . donuts??? And sometimes they seem to be allied with donuts, and other times use them as tools or enjoy them as a snack. Huh? 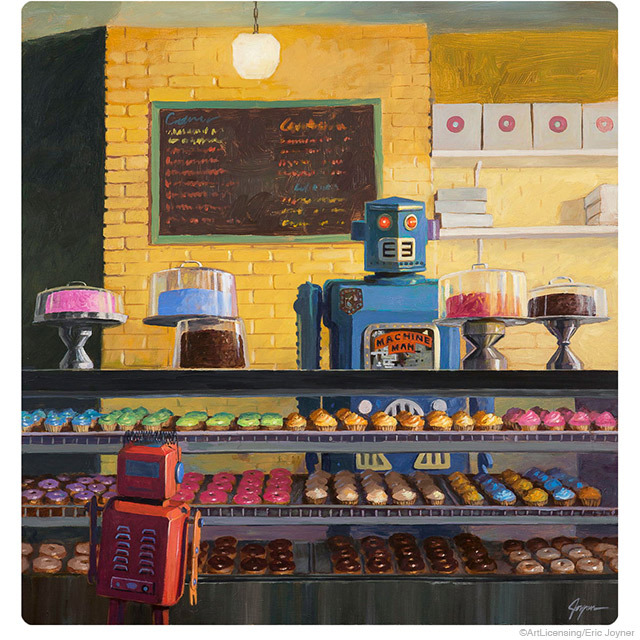 Well, Joyner makes no secret of the fact that he loves both toy robots and donuts, and he has said in interviews that they’re two things he thinks he could paint for 30 years, and not grow tired of them. 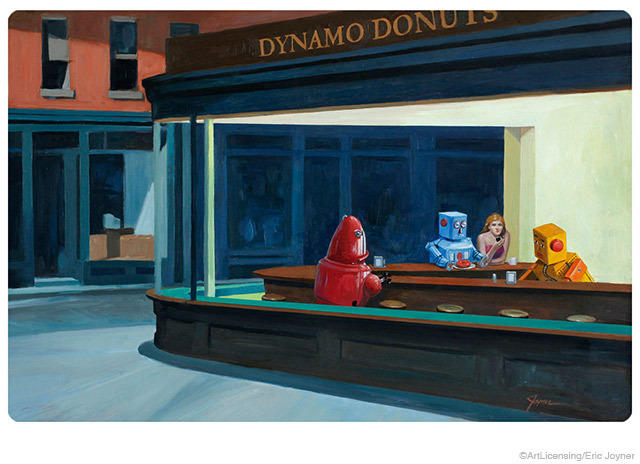 Sometimes the robots re-enact famous scenes from movies . . .
. . . or put their retro-futurist twist on famous works of art. Sometimes they have crazy adventures on strange worlds . . .
. . . and just basically live out their weird robot lives. 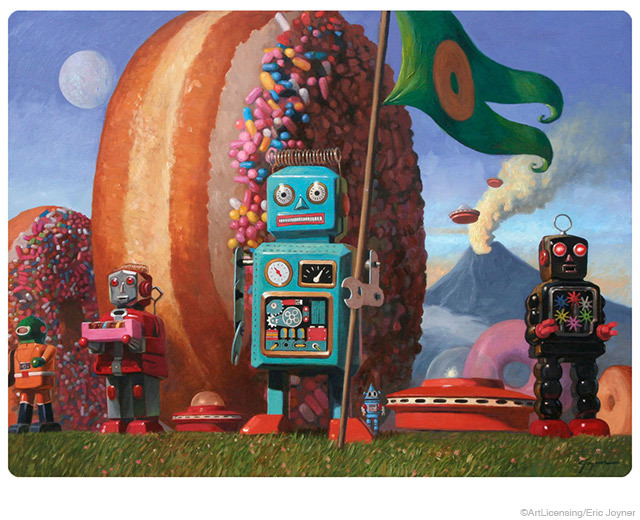 You might be surprised to learn that Eric Joyner describes his sci-fi paintings as “realistic.” There would seem to be nothing realistic about robots fighting donuts in surreal settings! 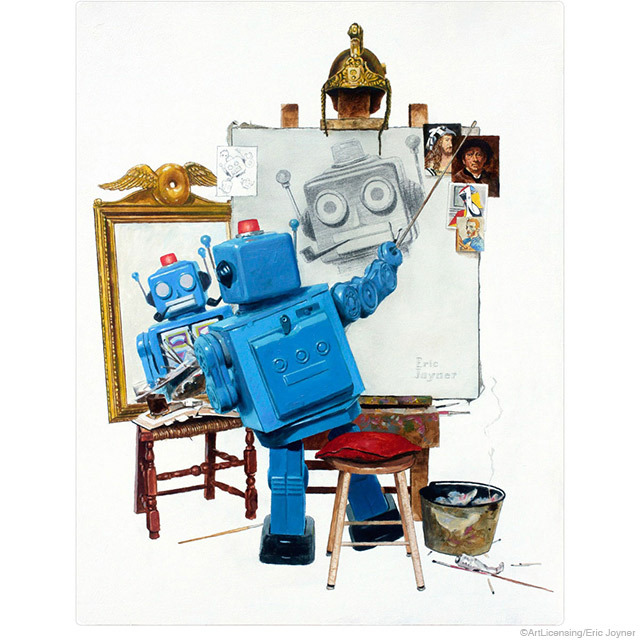 But what he means is that he enjoys bringing robots to life and engaging a viewer’s emotions. 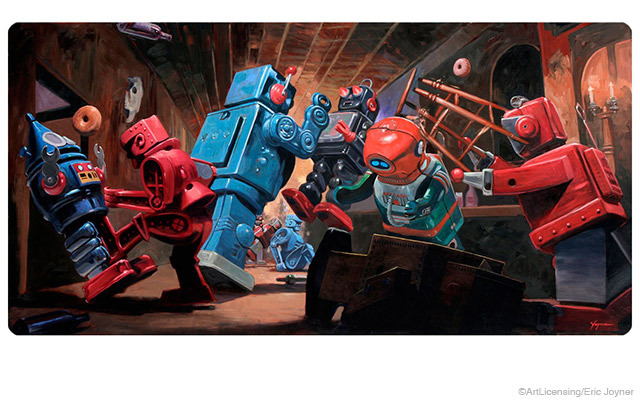 It’s true – you can’t help but react to Joyner’s whimsical toy robots doing their thing. You can appreciate his art as goofy, retro-style fun, but his designs really do engage your imagination. What’s the story here? How did things get to this point? What does it all mean to the robots? Or the donuts, for that matter? 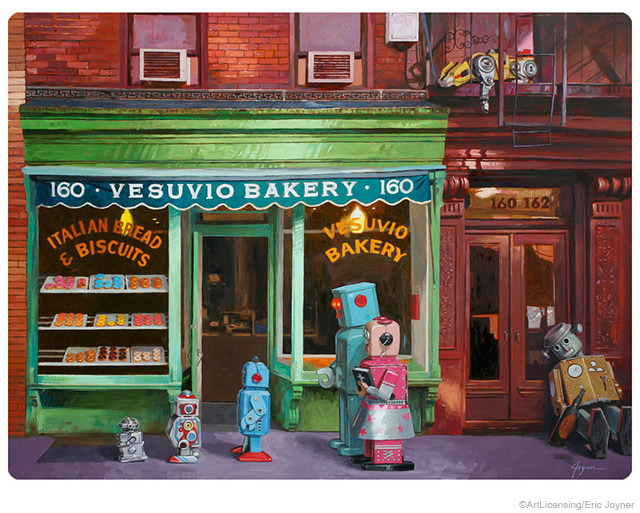 When you see Joyner’s robots doing what humans do every day, you can’t help but see the humanity in them . . . or the robot in us! Take a closer look and tell us what you think of these cool, quirky wall graphics, signs and stickers!